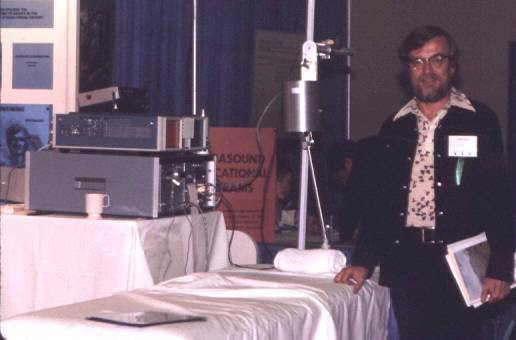 Pictured below and to the left is the ultrasound scan unit that launched my ultrasound career and pictured to the right is Dr. John M. "Jack" Reid (and his wife) who designed it while working with clinician Merrill Spencer in Seattle, Washington in the mid 1970's. 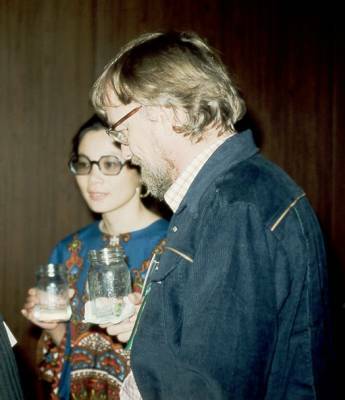 The fact that Dr. and Mrs. Reid are drinking from Mason jars is a giveaway that the photo must have been taken at the AIUM convention in Winston-Salem, N.C. in 1975 since this was one of the many personal touches provided by Dr. William McKinney as president of AIUM and host for that year's meeting! 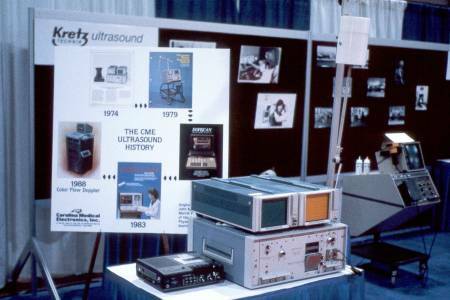 The equipment photo is from a history of ultrasound display at a later AIUM convention, probably in the late 1980's. 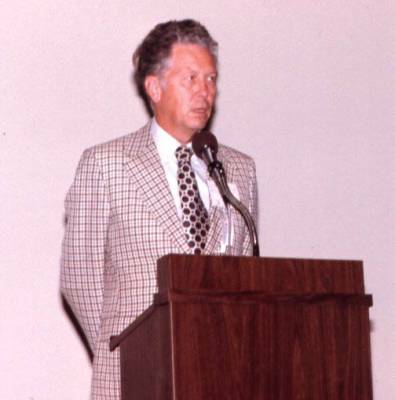 The images below were made at the Bowman Gray School of Medicine in 1974-1975. 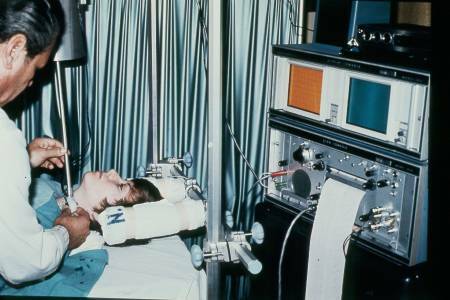 The scan unit employed a directional CW Doppler module with the transducer suspended in a position-sensing mount. 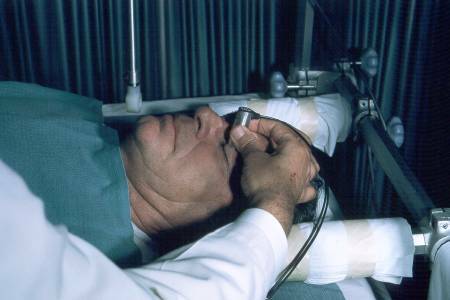 The transducer was moved back and forth along the course of the carotid artery and bifurcation. Whenever flow was detected a line would be drawn in the proper X-Y location on a storage oscilloscope. After scanning over the entire extracranial carotid area the instrument would have a "map" of the course of the common, internal and external carotid vessels. More careful interrogation could then be directed over any areas of concern and Doppler waveform tracings could be obtained on an oscilloscope or strip chart recorder so that both direction and amplitude of flow could be assessed. 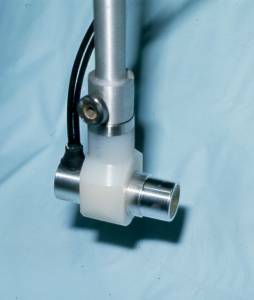 The transducer could also be removed from its direction-sensing arm and used for determination of flow direction in the ophthalmic artery as shown in the fourth image below (by placing the transducer over a thin layer of scan gel on the closed eyelid). The image below shows a carotid angiogram (a) showing complete occlusion of the internal carotid branch. 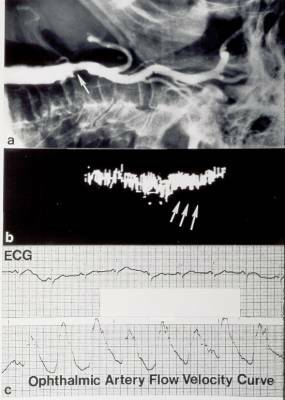 The corresponding DopScan image (b) also shows absence of expected flow signals where the internal carotid branch would normally be displayed (arrows). The Doppler waveform tracing from the ipsilateral ophthalmic artery (c) shows flow reversal. Reference: Blackwell E, Merory J, Toole JF, McKinney W: Doppler ultrasound scanning of the carotid bifurcation. Arch Neurol 1977 Mar;34(3):145-8. Photos by Eric Blackwell, M.D. 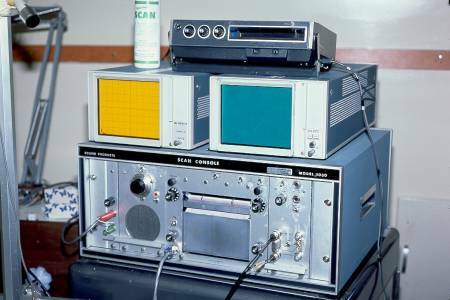 made about 1974-75 at the Bowman Gray School of Medicine Ultrasound Laboratory in Winston-Salem, N.C.